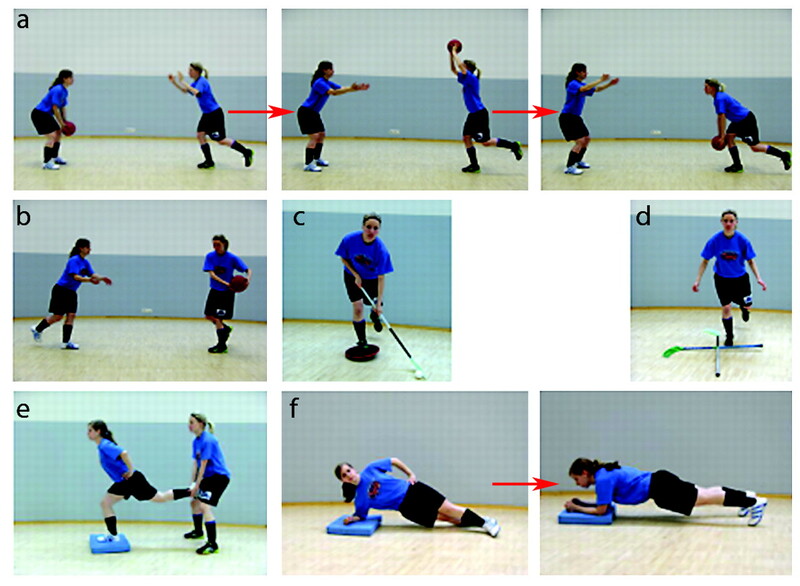 Objective To investigate whether a neuromuscular training programme is effective in preventing non-contact leg injuries in female floorball players. Design Cluster randomised controlled study. Setting 28 top level female floorball teams in Finland. Participants 457 players (mean age 24 years)—256 (14 teams) in the intervention group and 201 (14 teams) in the control group—followedup for one league season (six months). Intervention A neuromuscular training programme to enhance players’ motor skills and body control, as well as to activate and prepare their neuromuscular system for sports specific manoeuvres. Main outcome measure Acute non-contact injuries of the legs. Results During the season, 72 acute non-contact leg injuries occurred, 20 in the intervention group and 52 in the control group. The injury incidence per 1000 hours playing and practise in the intervention group was 0.65 (95% confidence interval 0.37 to 1.13) and in the control group was 2.08 (1.58 to 2.72). The risk of non-contact leg injury was 66% lower (adjusted incidence rate ratio 0.34, 95% confidence interval 0.20 to 0.57) in the intervention group. Conclusion A neuromuscular training programme was effective in preventing acute non-contact injuries of the legs in female floorball players. Neuromuscular training can be recommended in the weekly training of these athletes. Trial registration Current Controlled Trials ISRCTN26550281. Floorball has become a popular sport in Europe during the past decade.6 22 23 24 It can be described as hockey played indoors on a court (20 m × 40 m) surrounded by a low board. Floorball results in many injuries, with the knee and ankle joints being the most commonly affected sites6 22 23 24; 59% of acute ankle injuries and 46% of acute knee injuries occur through non-contact mechanisms.24 We investigated whether a systematic neuromuscular training programme could reduce the risk of acute non-contact leg injuries in female floorball players. On the basis of a recent study of injuries during floorball 24 we estimated an incidence of 0.6 leg injuries per person year. Our power calculation for this cluster randomised study was based on the assumption that we would detect a 50% reduction in the incidence of leg injuries, from 0.6 injuries per person year in the control group to 0.3 per person year in the intervention group. We set the statistical power to 0.80, the significance level to 0.05, and the coefficient of variation of incidence rate between clusters (at team level) to 0.04. Thus we estimated that we would need to recruit a minimum of 344 players from 24 teams for a follow-up of six months. During April and May 2005 we invited 36 female floorball teams in Finland to participate in this study. Twenty eight agreed. Informed consent was sought from each player. 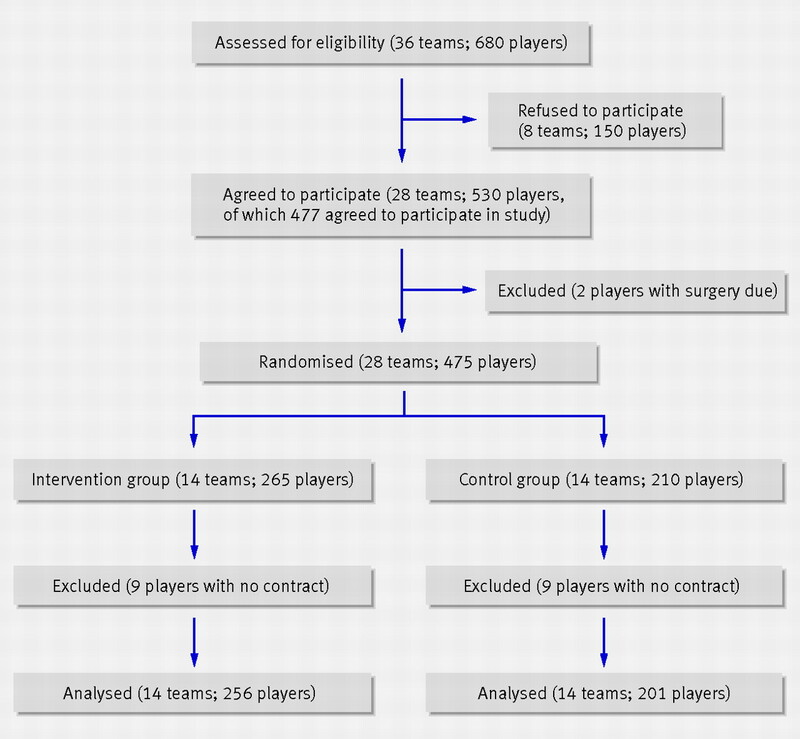 We included players if they were official members of the participating teams and had no major injury at study onset. Of 477 players who agreed to participate, 457 were eligible for the study. Using the team as the unit of randomisation we carried out stratified cluster randomisation to the intervention and control groups at league level (elite league and first division and second division). We controlled for floor composition (artificial or wooden) of the training venue of each team. The statistician (MP) who carried out the computer generated randomisation was not involved in the intervention. We informed the teams allocated to the intervention group about the upcoming training programme for preventing injuries. Teams in the control group were asked to do their usual training during the study period; after the study they received the same training programme and equipment as the intervention group. The neuromuscular training programme was developed by the medical and sports coaching staff of the UKK Institute. The feasibility of the programme was tested in one female floorball team during the summer preceding the intervention. The intervention took place between 1 September 2005 and 28 February 2006. At the start of the intervention period we educated one or two team members (coach, physiotherapist, or player) from each intervention group on how to use the training programme with their team. Each intervention team was provided with an instruction booklet, eight balance boards (disc diameter 35 cm; Fysioline, Tampere, Finland), eight balance pads (50×41×6 cm; Alcan Airex, Sins, Switzerland), eight medicine balls (ball diameter 28 cm, weight 1 kg, Togu Gebr Obermaier, Prien-Bachham, Germany), and an exercise diary. During the intervention period the educated instructors kept a diary of scheduled neuromuscular training sessions (content and duration of a session and number of participants). The programme was designed to enhance players’ motor skills and body control as well as to activate and prepare the neuromuscular system for sports specific manoeuvres. The programme consisted of four exercises: running techniques, balance and body control, plyometrics, and strengthening exercises (box and fig 1⇓). In addition, players who had difficulties with control of the lower back or limits on flexibility did stretching exercises for the first two weeks of training. They were also advised to continue these exercises in their own time. Each exercise had different variations, with diverse difficulty and intensity. The main point of each exercise was to focus on proper techniques such as good posture, neutral zoning of lumbar spine, core stability, and positioning of the hip and knee, especially “knee-over-toe.” The aim of the training was to improve control of the back, knees, and ankles during sports specific manoeuvres (running, cutting, stopping, standing) and thereby reduce the risk of injuries. Players worked in pairs and were guided to look at each other’s technique and to give feedback during training. The neuromuscular training sessions were carried out just before the floorball exercises, with a warm-up of low to moderate intensity for each exercise. One session lasted 20-30 minutes, with each exercise taking about five to seven minutes. The training was divided into four periods during the floorball season: two intensive training periods, which contained neuromuscular training twice or three times a week, and two maintenance training periods with one training session in the weekly programme. Intensive training took place at the start of the season and during the break from games in December. Over the competitive season the neuromuscular exercises were followed through with maintenance training. The primary outcome was an acute leg injury that occurred in non-contact circumstances (no contact with other player, stick, or ball). A secondary outcome was any injury to the legs (overuse injuries included). We defined an injury as acute if it occurred during a scheduled floorball game or practice, preventing the player from participating in a game or practice session for 24 hours. The severity of injuries was defined according to Ekstrand and Gillquist25: minor injury—an injury causing absence from practise for 1-7 days; moderate injury—an injury causing absence from practise for 8-28 days; major injury—an injury causing absence from practise for more than 28 days. At baseline, players completed a questionnaire on background information, including anthropometrics, previous injuries, experience with floorball, and preseason training volume. During follow-up each coach recorded the players’ scheduled practice and game hours on an exercise diary and noted all injured players. Injuries were recorded using a structured questionnaire. Injured players recorded the time, place, cause, type, location, and severity of the injury. After each follow-up month the coach mailed the diaries and questionnaires to the study doctor (TM). The study doctor contacted players after each new injury and checked the accuracy and consistency of the questionnaire data. She was responsible for the data collection but was not involved in the intervention. The player was defined as injured until she was able to train and play floorball again. At the end of the season all players filled in a questionnaire on injuries and subjective participation in the study to check the completeness and coverage of data collection. We expressed the incidence (95% confidence interval) of injury as the number of injuries per 1000 hours of floorball practise and play. One way analysis of variance was used to estimate the intracluster correlation coefficients of incidence rates for injury. The unadjusted and adjusted incidence rate ratio between the two groups (intervention v control) was obtained from two level Poisson regression models. We considered a P value <0.05 to be significant. In the data analysis by multilevel modelling we took the cluster randomisation into account. Adjustments were done by individual level (age, body mass index, experience of floorball, playing position, and number of orthopaedic operations) and team level (league level and previous incidence of injuries). We did analyses according to the intention to treat principle. In addition to the intention to treat analyses, we carried out efficacy analyses to evaluate the potential benefits of high compliance and adherence to training (high indicating those teams that carried out the neuromuscular training at least three times a week during the first intensive period, at least twice a week during the second intensive period, and at least once a week during the maintenance periods). We used the MLwiN (version 2.02) software package for multilevel analyses. Figure 2⇓ shows the flow of teams and players through the study. The consent rate for participation was high (86% of players from 28 teams) and the dropout rate low (5%). Twenty one players dropped out during the study period because of severe injury: nine from the intervention group (eight knee ligament ruptures and one rotator cuff rupture of the shoulder) and 12 from the control group (six knee ligament ruptures, four ankle ligament ruptures, and one lumbar disc prolapse. Data from these players were included in the analyses for the time they participated. The players in both groups were similar for age, body mass index, experience of floorball, and scheduled hours spent in training and play (table 1⇓). No significant differences were found between the groups in number of previous injuries, operations, or preseason training volume. Five teams (36%) in the intervention group used the training programme according to schedule, six (43%) had some irregularities in training, and three (21%) interrupted training during follow-up. Table 2⇓ shows the training volume of the intervention teams. A mean 74% of the intended training sessions were carried out as planned. Participation in the intervention during the first intensive and maintenance periods was more active than during the second periods (table 3⇓). Irrespective of adherence to the intervention, all teams continued data collection to the end of the study. Some of the players in the control group also did neuromuscular exercises during the study period: running technique, strengthening exercises, plyometrics, and balance board exercises (table 4⇓). The number and frequency of these exercises were lower than in the intervention group. Overall, 32 327 scheduled hours of training and play was reported for the intervention group during the season, with a total of 87 leg injuries compared with 25 019 hours of training and play and 102 leg injuries in the control group. Significantly fewer non-contact leg injuries (adjusted incident rate ratio 0.34, 95% confidence interval 0.20 to 0.57, P<0.001; table 5⇓) occurred in the intervention group than in the control group. The overall risk of leg injury was significantly different between the groups, favouring the intervention (adjusted incidence rate ratio 0.70, 0.52 to 0.93, P=0.016). This difference was due to a reduction in non-contact leg injuries as no differences were found between the groups for acute contact injuries or overuse leg injuries. Six ruptures of the anterior cruciate ligament occurred in the intervention group, of which three were non-contact injuries, compared with four ruptures of the anterior cruciate ligament in the control group, of which three were non-contact injuries. In efficacy analysis, intervention teams with high compliance and adherence to the neuromuscular training had a lower risk of injury than the control group: the incidence rate ratio between the high compliance group and control group for non-contact leg injury was 0.19 (95% confidence interval 0.06 to 0.64, P=0.007), for non-contact ankle ligament injury was 0.19 (0.05 to 0.82, P=0.026), and for non-contact knee ligament injury was 0.32 (0.04 to 2.59, P=0.284). A neuromuscular training programme was effective in preventing acute non-contact leg injuries in female floorball players. The programme, aimed to enhance motor skills and body control, reduced the risk of leg injury by 66%. The intervention focused on improving the players’ motor skills and body control as well as preparing the neuromuscular system for sports specific manoeuvres. The programme was designed to reduce the incidence of acute non-contact leg injuries, which are common in floorball. Compared with the control group that received usual training, the intervention group had significantly fewer injuries. A reduced injury rate was found overall for leg injuries as well as for acute non-contact leg injuries. The greatest effects were observed in non-contact injuries of the ankle ligament. Some studies have indicated that neuromuscular training probably plays a crucial part in the prevention of injuries12 13 14 15 16 17 18 and this intervention study supports these findings. In one study a multiple training programme for six weeks in high school sports teams reduced the rate of serious knee ligament injuries as well as the rate of non-contact knee ligament injuries.13 Another study showed that a structured warm-up programme among young handball players reduced the risk of traumatic knee and ankle injuries and the overall risk for severe and non-contact injuries.17 We found similar reductions in the risk of non-contact leg injuries, but when we analysed injuries by location, the risk of only ankle injuries reached statistical significance. The 51% reduction in non-contact knee ligament injuries did not reach significance, but the trend was parallel to that of overall non-contact leg injuries. Our study had some limitations. Firstly, the potential for not achieving double blinding in this type of study limits the strength of the conclusions. The randomisation phase, data collection, and data analysis were blinded, but for obvious reasons the coaches and players could not be blinded. Secondly, the sample size was sufficient for analyses of non-contact leg injuries but too small for detailed analysis of anatomical subgroups. The study had many strengths. The validity of the data was high as 86% of eligible players from 28 floorball teams could be recruited. In addition, the intervention and control groups were similar for baseline characteristics, dropout rate, and training and play during follow-up. Compliance in collecting the data on exposure and injuries was also good. The neuromuscular training programme was a modified combination of interventions from previous studies, and the exercises were easy to learn. The programme was designed to reduce the incidence of acute non-contact leg injuries. Contact injuries, caused by contact with another player, stick, or ball, are also common in floorball24 although more difficult to prevent. The training programme included many different exercise manoeuvres with several variations so it was not possible to determine which particular manoeuvre was effective in preventing injury. The determination of type of injury may not, however, be necessary, because floorball, as with all other team sports, includes a wide variety of fast and dynamic movements. To obtain proper body control and correct technique in sports specific manoeuvres, it would probably be wise to practise the required skills by noticeably varying the tasks. Also, standardisation of neuromuscular training is likely to be a key to injury prevention. To maintain the preventive effect we recommend the inclusion of varied neuromuscular exercises in weekly training programmes all year. Five teams (36%) from the intervention group carried out the programme regularly through the season. Six teams (43%) had irregularities in training and three (21%) interrupted training. On the basis of information in the exercise diaries and players’ subjective estimation of participation, it seemed that training activity was highest during the first two training periods, after which it declined. The intervention teams were, however, included in analyses regardless of their intervention training activity and therefore the effect of the programme might be even higher than reported. The efficacy analysis confirmed that the risk of injury was lower among those teams that trained regularly. Although severe knee ligament injuries, particularly injuries of the anterior cruciate ligament, are of concern in female floorball, this study could not analyse the effect of the neuromuscular warm-up programme on these injuries because there were too few such cases (three non-contact ruptures of the anterior cruciate ligament in both intervention and control groups). It is noteworthy, however, that none of these ruptures occurred among the five teams that trained regularly through the season. During the study it became obvious that some players in the control group did similar exercises to players in the intervention group, because these exercises are commonly used in sports training. Training among these controls did not reach the level of the intervention group, however, and if this partial contamination of the controls biased the results of the study it erred on the side of underestimating rather than overestimating the effect of the neuromuscular training on the risk of injury. In the intervention a strong emphasis was placed on proper technical performance of every exercise. We considered it important that the intervention coaches and players had good knowledge of the correct training technique, typical mistakes in each exercise manoeuvre, and appropriate methods for their correction. We emphasised that training with incorrect technique was likely to result in improper motor skills and body control and might increase the risk of injury. This intervention study focused on women floorball players in three top level leagues in Finland. Because floorball players have a similar pattern of leg injuries and injury mechanisms, the training programme could be effective in floorball in general including players that are male, young, or play for recreational purposes. Further studies are needed to verify the training effect in these groups. As it is easier to learn motor skills while young, we recommend that regular neuromuscular training of floorball players should begin no later than age 12. Correction of poor motor technique may be more difficult in adulthood—at least the learning process takes substantially more time and repetitions than that in childhood. In conclusion, a neuromuscular training programme was effective in preventing acute non-contact injuries of the leg in female floorball players. Such training should be included in the weekly training of this sport. We thank the players, coaches, and instructors of each participating team and the physiotherapists who participated and the Finnish Floorball Federation. Contributors: All authors conceived and designed the study. KP carried out the literature search, coordinated and managed the study, which included testing and refining the intervention and data collection. HH contributed to testing the intervention and educating the instructors, which was planned with KP. TM collected the data and carried out preliminary preparations of the data. MP analysed and interpreted the data. KP wrote the first draft of the paper and all authors provided substantive feedback on the paper and contributed to the final manuscript. KP is guarantor. Funding: Finnish Ministry of Education and Medical Research Fund of Tampere University Hospital, Tampere, Finland. The funding sources did not have any involvement with the progress of study. Ethical approval: This study was approved by the ethics committee of the Pirkanmaa Hospital District, Tampere, Finland (ETL-code R04072). Parkkari J, Kannus P, Natri A, Lapinleimu I, Palvanen M, Heiskanen M, et al. Active living and injury risk. Int J Sports Med2004;25:209-16. Ekstrand J, Gillquist J. Soccer injuries and their mechanisms: a prospective study. Med Sci Sports Exerc1983;15:267-70. Wedderkopp N, Kaltoft M, Lundgaard B, Rosendahl M, Froberg K. Injuries in young female players in European team handball. Scand J Med Sci Sports1997;7:342-7. Messina DF, Farney WC, DeLee JC. The incidence of injury in Texas high school basketball. A prospective study among male and female athletes. Am J Sports Med1999;27:294-9. Snellman K, Parkkari J, Kannus P, Leppälä J, Vuori I, Järvinen M. Sports injuries in floorball: a prospective one-year follow-up study. Int J Sports Med2001;22:531-6. Hinton RY, Lincoln AE, Almquist JL, Douoquih WA, Sharma KM. Epidemiology of lacrosse injuries in high school-aged girls and boys. A 3-year prospective study. Am J Sports Med2005;33:1305-14. McHugh MP, Tyler TF, Tetro DT, Mullaney MJ, Nicholas SJ. Risk factors for noncontact ankle sprains in high school athletes. The role of hip strength and balance ability. Am J Sports Med2006;34:464-70. Kofotolis ND, Kellis E, Vlachopoulos SP. Ankle sprain injuries and risk factors in amateur soccer players during a 2-year period. Am J Sports Med2007;35:458-66. Deacon A, Bennell K, Kiss ZS, Crossley K, Brukner P. Osteoarthritis of the knee in retired, elite Australian rules footballers. Med J Aust1997;166(4):187-90. Lohmander LS, Englund PM, Dahl LL, Roos EM. The long-term consequence of anterior cruciate ligament and meniscus injuries: osteoarthritis. Am J Sports Med2007;35:1756-69. Ekstrand J, Gillquist J, Liljedahl S. Prevention of soccer injuries. Supervision by doctor and physiotherapist. Am J Sports Med1983;11(3):116-20. Hewett TE, Lindenfeld TN, Riccobene JV, Noyes FR. The effect of neuromuscular training on the incidence of knee injury in female athletes. A prospective study. Am J Sports Med1999;27:699-705. Wedderkopp N, Kaltoft M, Lundgaard B, Froberg K. Prevention of injuries in young female players in European team handball. A prospective intervention study. Scand J Med Sci Sports1999;9:41-7. Heidt RS, Sweeterman LM, Carlonas RL, Traub JA, Tekulve FX. Avoidance of soccer injuries with preseason conditioning. Am J Sports Med2000;28:659-62. Emery CA, Cassidy JD, Klassen TP, Rosychuk RJ, Rowe BH. Effectiveness of a home-based balance-training program in reducing sports-related injuries among healthy adolescents: a cluster randomized controlled trial. CMAJ2005:172:749-54. Olsen O, Myklebust G, Engebretsen L, Holme I, Bahr R. Exercises to prevent lower limb injuries in youth sports: cluster randomised controlled trial. BMJ2005;330:449. McGuine TA, Keene JS. The effect of a balance training program on the risk of ankle sprains in high school athletes. Am J Sports Med2006;34:1103-11. Verhagen E, van der Beek A, Twisk J, Bouter L, Bahr R, van Mechelen W. The effect of a proprioceptive balance training program for the prevention of ankle sprains. A prospective controlled trial. Am J Sports Med2004;32:1385-93. Söderman K, Werner S, Pietilä T, Engström B, Alfredson H. Balance board training: prevention of traumatic injuries of the lower extremities in female soccer players? A prospective randomized intervention study. Knee Surg, Sports Traumatol, Arthrosc2000;8:356-63. Aaltonen S, Karjalainen H, Heinonen A, Parkkari J, Kujala U. Prevention of sports injuries. Systematic review of randomized controlled trials. Arch Intern Med2007;167:1585-92. Löfgren O, Andersson N, Björnstig U, Lorentzon R. Incidence, nature and causes of floorball injuries. Scand J Med Sci Sports1994;4:211-4. Wikström J, Andersson C. A prospective study of injuries in licensed floorball players. Scand J Med Sci Sports1997;7:38-42. Pasanen K, Parkkari J, Kannus P, Rossi L, Palvanen M, Natri A, et al. Injury risk in female floorball. A prospective one-season follow-up. Scand J Med Sci Sports2008;18:49-54. Ekstrand J, Gillquist J. The avoidability of soccer injuries. Int J Sports Med1983;4:124-8.